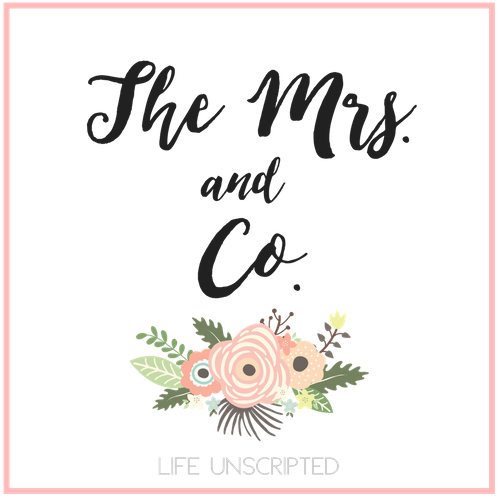 Raegan's Schedule - The Mrs. & Co. I don't know about you, but I thrive off a schedule. Well turns out, so does miss Raegan! Now there are many opinions out there about when it's appropriate to put a baby on a schedule. As a new mom, I had and sometimes still have no clue what I'm doing! But I paid attention to my little love bug and started realizing I was actually the one making her cranky and fussy! Now newborns are on such sporadic schedules that trying to put them on one will likely drive you insane! Especially because they are up throughout the night numerous times. From the time Raegan came home from the NICU we just continued the schedule we had learned in the hospital. Feed every 3 hours. And before you feed, change her diaper. So that you can put baby back down right after her feeding. And that worked well for us at the beginning when she was sleeping all the time! Then she started to be more awake and we kind of took the stance of if she's awake, we will let her be awake. Yeah, that didn't work. Babies need sleep and they won't always go to sleep even when they need to! So the result of that was a very overly tired baby and very tired parents. 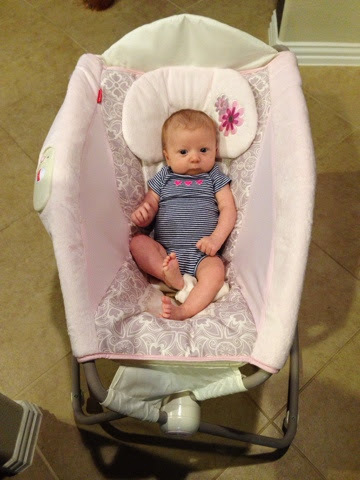 So I started doing research and it showed that a baby Raegan's age, 6 weeks old (yes, 6 weeks. I can't believe it either!) should only be awake 40-50 minutes at a time. Well there was our problem! We were keeping her up too much! She needed some awake time to allow her to get stronger both physically and socially, but she was getting too much! She was getting overly tired and pretty much wasn't napping at all during the day and if she was, I had to be holding her and if I did manage to nail the transfer from me to the bed, they were short little cat naps. I was getting nothing done and things had to change!! Hence, I started Raegan on a schedule. Every baby is different and may not be able to tolerate a schedule at 6 weeks. This is just what worked for Raegan and I. 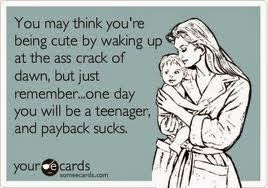 You have to do what's best for you and your sweet baby. So let's start at the beginning of the day. Raegan wakes up at 5:30am from sleeping the whole night. So we will start there. I know, we are blessed with a baby that sleeps through the night at 6 weeks. I've decided we are due something easy because Lord knows getting pregnant with her was anything but easy!!! 5:30am- Kyle feeds Raegan while I pump. Praise Jesus for that man! I do my devotional while I pump. It's the only time of day where I can fit it in! Early morning with my Lord! 6:15am- Kyle leaves for work and I go back to bed. 8:30-9am- Raegan wakes up. I change her and feed her and put her right back down. 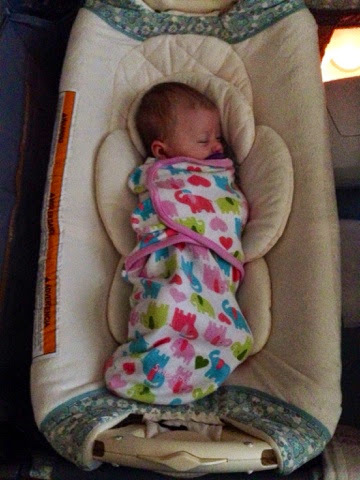 Whenever she is being fed or sleeping, she is swaddled. This is a physical cue for her to know we are eating then going to sleep. 12pm- I change her and feed her. If she's acting like she's tired. I put her back down. If she's awake, then I put her in her rocker in the bathroom with me and I pump while doing my make up and hair. Impressive multi tasking going on! Then we play for alittle bit before putting her down. I watch her for cues of yawning or rubbing her eyes. If she does this while I'm getting ready, I stop and put her down and continue getting ready after she's down. And if I need to run an errand, this is the time I do it and I don't put her down. She takes a few cat naps while we are out. 3pm- change, feed, and down for a nap. She may sleep till 6. If she does, great, if she doesn't, we play for a bit. But I don't get her up until at least 5:15 so that she's not overly tired at 6pm for her feeding. 6pm- change, feed, and play until daddy gets home around 7pm. 7pm- go for a walk, take a bath, then one last feeding before bed. 8-8:30pm- down for the night. She normally will sleep until 4 or 5 the next morning. She may eventually need a dream feed (10-11pm) before we go to sleep, but she hasn't needed that yet. Of course, her schedule changes occasionally up or down an hour, but I just go with it. And sometimes she sleeps less or longer. You have to ebb and flow with baby's tempo. If you have any questions, let me know in the comments and I will answer them the best I can! Don't get discouraged if your baby doesn't respond to a schedule yet. They will! And sometimes you will have to sit by their bed as they sleep to help soothe them if they are waking up multiple times throughout their nap. That's exactly what I'm doing right now! Tune in for my next post of how I put Raegan down and how I keep her asleep! Swaddles are the best! It was a sad few nights when we transitioned out of them! Sounds like y'all have a great schedule going! Swaddling is amazing. C has a love hate relationship with her swaddle. We're about to come crashing into a schedule when I go back to work so I'm ready to get into that mode now! I cannot get over how cute R is!! Keep up the good work Momma! She's a lucky little peanut to have you & Kyle as parents. I'm tuning in for your next post on how she stays sleeping so long. How old was she when that started happening? I love hearing about babies' schedules. I've never brought any baby home, so the whole thing just baffles me and I get interested in how it all actually works. You're doing a great job, mama!